And the peace of God, which surpasses all understanding, will guard your hearts and your minds in Christ Jesus” (Philippians 4:6-7 ESV). 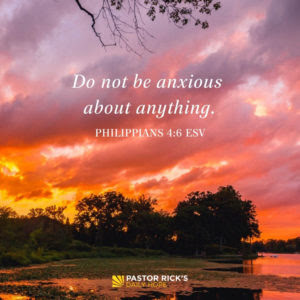 When you pray to God about your worries, do you get specific? If not, what difference do you think it would make if you did? Read Psalm 23, and then practice the ideas on meditating from today’s devotional. What new insights do you gain? Philippians 4:7 says that God’s peace “will guard” your heart and mind. What do you think that means?